The colors panel has two views you can switch between: Color Wheel (shown on the left) and Color Swatch (shown on right). Just tap the button in the upper right to switch between them. 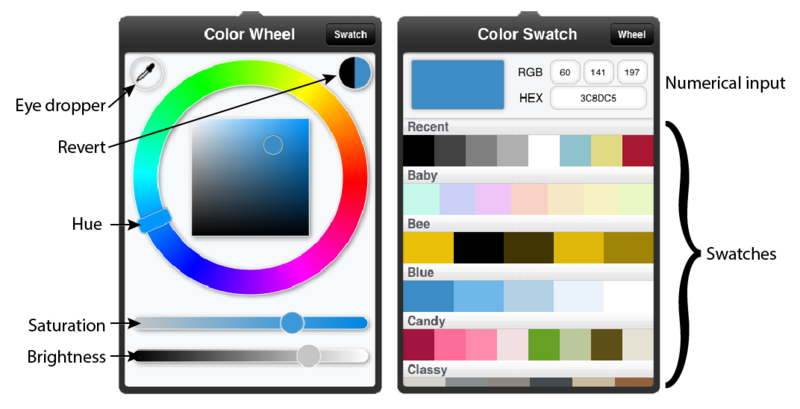 The Color Wheel view allows you to modify the current color. The big wheel in the center lets you adjust the color's Hue. The box inside the wheel lets you simultaneously adjust the color's Saturation and Brightness or you can use the separate slider controls below to adjust Saturation and Brightness independently. In the upper right you see a bubble displaying the previous and current color as you adjust. You can tap it to revert back to the color you started with when you opened the panel. In the upper left is the eye dropper. 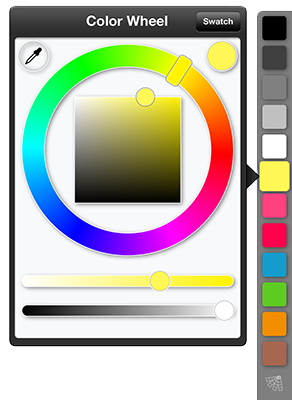 You can tap there and then tap anywhere on the canvas (or reference image) to sample colors. 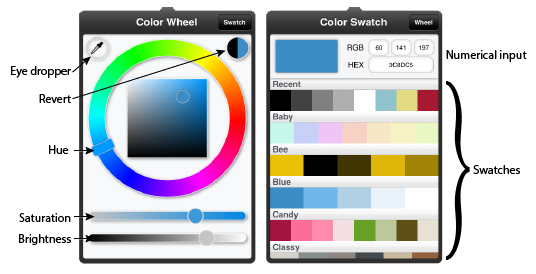 The Color Swatch view gives you two additional ways to choose colors. At top are numerical entry controls where you can type in RGB (red, green, and blue) values or a HEX (hexadecimal) value. This is useful if you are using a reference online or in a book that gives numerical values for colors. Below the numerical entry controls are a set of swatches. Each swatch has a variety of colors that look nice together or fit a particular theme or subject matter. The very first swatch is dynamic and always keeps your most recently used 8 colors available. On the iPad there is a pop up color swatch in the bottom right behind the canvas. This is useful if you're frequently switching between a swatch of colors while working on a sketch. You can hide or show it whenever you like and change the colors by tapping and holding a cell to bring up the color panel. You can sample a color from your canvas directly into a cell by tapping the eye dropper icon in the color panel.